It’s no surprise that the housing market is looking to change in the coming year. As basically everyone has stated, mortgages are likely to go up, inventory is going to be tighter, and the cost of building is going to be more expensive. But what does this mean as a real estate investor? After all, real estate investing in 2017 is going to be different than just being interested in the market. First things first, let’s see what the actual projections are. Then we can see what that means for real estate investing in 2017. Ok, so without needing to buy an FHA loan it looks like credit approval will be easier to come by. That’s awesome! Fortune.com predicts that “though rates may rise, mortgage credit will likely be more widely available due to slightly looser lending standards” like those mentioned by The Washington Post. But if housing loans are going to be easier to come by, why will rates rise? That’s not so different from where it was only a few months ago at around 3%, but why exactly is making mortgage rates higher? Again, as a reaction to the election, the cost of building houses are going to go up. Similarly to how house mortgage rates reacted to the recent election, building costs are estimated to go up because of increasing construction wages, and lack of cheaper immigrated labor. As a mix of the increased mortgage rates combine with the growing expense of building houses, it’s estimated that there will be less buyers in the market. And as the “if / than” statement goes – if there are less buyers, than sales will go down – you would think that the outlook isn’t so good for real estate investing in 2017. While building costs and sales may look daunting always remember that, as a real estate investor, you’re not focusing on new builds as much as someone just entering the housing market. You’re not someone looking to be a homeowner, you’re an investor. So the properties that you’re looking at are ones that need help, need repair, and are definitely not brand spanking new houses. Even so, is the volatile housing market in 2017 enough to deter buyers from your inventory? That’s sort of a loaded question. Image credit: Realtor.com, numbers; GordCollins.com, graph. Rising mortgages and interest rates are something that potential homeowners aren’t thrilled about. So, as far as the first quarter of 2017, you might have resistance in moving your inventory to home buyers looking to live there. But, that doesn’t mean that real estate investing in 2017 will take a hit as a whole. After all, you aren’t just selling to first-time home buyers, or potential homeowners. You’re also selling to other investors, and people who want to be landlords. As long as someone is paying cash in full, you can still move your inventory – just not to people who want a house to live in. As far as strategy goes, you should focus on selling to other investors at the start of 2017, then move to selling to homeowners as the housing market settles down. Remember, people still need places to live. And, there’s a whole lot of new first-time buyers heading this way. So, new builds will be more expensive, and your inventory might be tight for a bit, but that doesn’t mean there still won’t be homebuyers. After all, those millennials are finally old enough to buy houses. Remember what we talked about as far as housing loans being easier to come by? More and more young adults are getting approved and actually able to buy houses, and the majority of them aren’t looking at new builds. They’re looking for fixer-uppers. And who better to sell them a fixer-upper? Real estate investors. Whether you’re wholesaling or flipping, the houses you’re selling are the exact product that roughly half of new buyers are looking for. So while 2017 may look scary for builders and realtors, it seem to be shaping up to be a pretty good atmosphere for investors. 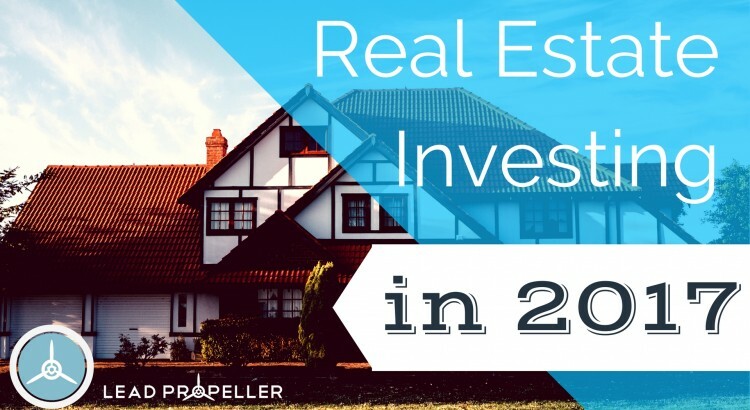 So What Does Real Estate Investing in 2017 Really Look Like? As long as you play your cards right, this should still be a good year for your real estate investing business. Yes, there are things to look out for like an increase in building costs. If you’re a flipper, or have been focusing on empty lots or new builds in the past, then a change in your strategy for 2017 would be a good idea. For flipping, you have to take into account the new rise in construction, renovation, and overall building cost. You’ve probably already got a team of contractors that you trust, who rates are mostly fixed, and that’s awesome! But, if you’re new to flipping, you’ll need to shop around and work on your negotiating to make sure that the cost of your flip doesn’t outweigh what you’re able to sell it for, or what you paid for it. Who should you focus on selling to? In the start of the year, wholesaling in general is the way to go. There won’t be too many potential homeowners looking to buy because of the increase in mortgage rates. But if you’ve found a cash buyer, then you’re set! Remember, if they pay in cash, they don’t need a home loan. As we’ve talked about in our other articles, growing a buyers list isn’t a difficult thing to do, and is a great way to expand your business! Especially when real estate investing in 2017 looks like it’s going to be friendly to wholesalers. There are tons of strategies, like posting to Craigslist, going to local Real Estate Investing Associations, and social media marketing. But the best by far is having a website for your real estate investing business. We won’t talk about it too much, but think of it this way: you go online for basically everything. You search for recipes online, you look up movies – if you have a question about anything you Google it first. Motivated sellers, and other real estate investors, are no different. If you need someone to buy a property, wouldn’t you go online to look first? About 50% of Americans already do.